Grocery store operator Jim Scanlon is closing his visionary store Jim’s Local Market that was created to address the scarcity of supermarkets in a low-income community in Newport News. The store is closing Wednesday. “It’s just that the sales are not there, and the profitability is not there. It’s not working out,” Scanlon said Monday. As many of you know Jim’s Local Market was one of the potential operators being considered for the new East End Grocery store. Jim’s aspirations and goals for the store that he opened in Newport News, VA seemed to be a good fit for what is being attempted in the East End. Given the association between Jim, his closing store, and the East End Grocery Church Hill and East End folks have expressed concern about the viability of the project. 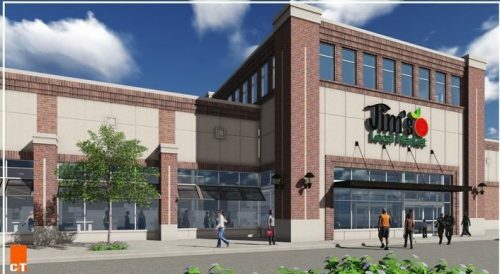 CHPN spoke with Norm Gold, the East End Grocery store’s future operator, and he thinks there are several key factors that will help ensure the success of the new store. I feel very sad for Jim. I’ve never met a nicer, more dedicated man. His grocery skills are unsurpassed. I believe the support he got at first wasn’t sustained which left him on his own. I don’t see it having any negative implications on our store. As with any business, you learn from others who have tried similar ventures. Unfortunately, with this one, I gained knowledge at the detriment of Jim’s store. I had a wonderful conversation with Jim before I took on this role and he gave me some great advice, and pointed out what he struggled with most. It has helped us direct and focus our efforts, particularly in the community engagement and staff training. Our Community Advisory Committee, headed by Mike Maruca, is and will continue to be, a key component in our success, Our store will be a proud neighborhood market that fits in with all incomes and diversities. The outreach we are doing in the community has already given us great insight in what would entice shoppers throughout the East End. We are so fortunate to have the amazing support of Steve and Kathie Markel. We have dedicated partners in this project like VCU, J Sargeant Reynolds College, and the American Heart Association as well as many other organizations in the area like the Peter Paul Development Center, the Richmond Food Justice Alliance, and the Community Action Network. A partnership with Caritas will provide life skills training for our staff to ensure their success. We also have very strong support from Councilwoman Newbille and the Mayor’s office. With the support and partners dedicated to this project, I am truly confident that our store will be successful and a model for other stores in similar locations. I started out really excited for a supermarket close to home, but now I’ll believe it when I see it. I’m very confident (this is Jacob btw) that a grocery store will open there. However, it’s going to take careful planning, community buy-in, and efficient operation for it to be a success. The grocery business has historically low margins so it’s a challenging space to get into. Gustavo here- we went to the meeting on the 18th, and it was just great to see how they were open to most of the possibilities while acknowledging the complexity of the task- is this grocery store going to be all things to all people? The answer is no, but it’s going to be a huge step forward to make the neighborhood even more walkable and profitable. We all need to remember that J Sergeant Reynolds and VCU are big parts of this project so we’re talking about a good amount of people and money being invested in the area. This is also not like the same neighborhood in Newport News either. I dunno, I’m just hopeful and so are many of our peers. Id say Im cautiously optimistic. The Church Hill grocery is doing the right thing, proving out the market and getting the community on board. The Newport News operation didn’t have that community buy-in. Further, the Newport News community where Jim located is completely in crisis in the immediate area, and it doesn’t have large portions of stabilizing areas like Church Hill has. Apples and Oranges. I am so sorry to hear of the store closing, It is so important to support local business owners whenever possible. It is unfortunate because Jim wanted to help provide access groceries in areas identified as food deserts. Disappointing to say the least. It’s nice to have “…great incite” but the telling factor in the long run will be the difference between what is needed and what is wanted. Trader Joes at this location would be a dream. According to Mayor Vick she heard high prices, which she didn’t believe and shoplifting contributed to the closing. Scanlon had to hire additional security in 2016 and there were numerous signs warning against shoplifting. From Daily press, newport news. This is why people can’t have nice things and those that try to help in areas that need them are normally met with this. Sad. I missed something, was it built yet? Jim’s Local Market was built in Newport News. It was supposed to be what is now Norm Gold’s project and the upcoming East End Grocery Store. People were concerned. Check the article for more! Newport News, 312, Newport News. Not quite Newport Beach, but close (not)!!!! @ray It’s the Californian in me. My bad, thanks for the edit. This is my fear with the 25th Street project. It’s success seems to be predicated on the Markels being willing to subsidize losses philanthropically. How long will they be willing to do that, particularly if tbe store develops problems similar to Jim’s? Is a store that has its books balanced by the voluntary generosity of one donor a real business plan? I have often wondered if a different model wouldn’t work better here—that of a food cooperative. It would give local residents a greater stake in the success of the store, provide similar training and work opportunities for the community and reduce some of the revenue pressures by operating as a not-for-profit with reduced labor costs due to member requirements to help with store duties. #16 – Some good questions. It’s difficult enough to successfully run a grocery store as a business. So it’s going to be interesting to see how successfully a grocery store can be run as a charity. Not necesssarily. Why couldn’t the co-op have a sliding scale membership fee? Or allow people below certain income levels to make up their fee with added work hours at the coop as sweat equity? It’s about finding the right structure to make it work. 1) If you live in Creighton Court, it’s less than a mile to this new store; it’s just over 2 miles to the new Walmart on Nine Mile Rd. Does anyone really think this new Church Hill store, which will certainly have higher prices and less selection than Walmart, to be the beneficiary of all the grocery shopping business from the residents living at neighborhoods like Creighton most who, believe it or not, have access to transportation? 2) I, as well as many readers of this site, am part of the gentrifier population. I own a car, as do the vast majority of my fellow gentrifiers, and I tend to shop at grocery stores that have the selection of products I want at good prices. I seriously doubt, therefore, this new store would be a part of my regular shopping routine nor that of many people like me. Now, this new store may be so unique and incredible that I will do the bulk of my shopping there. Realistically, however, I just don’t think that will be the case. That said, I really hope this new store succeeds but I have some serious doubts. Let’s just hope the Markel’s are willing to subsidize this venture for some time to come. The market research and community outreach for this store is unprecedented in Richmond. And a culinary school next store – a legit one – will really create a sense of a greater food “place.” I predict that it will be a draw. And don’t forget that it’s impossible to walk or to take the bus to that WalMart. Very pedestrian-hostile. @20 I, too, am a gentrifier with a car. I hate driving across town to buy groceries and am eager to support local business and spend my money alongside longtime residents in a way that might help uplift the east end. Best of luck to the new grocery – I look forward to shopping there. I’m not quite sure what all this unprecedented market research and community outreach really means — they said the same thing about a baseball stadium in Shockhoe Bottom while also touting it’s “walkability” — but as a fellow Broad Streeter, I can tell you I ain’t walking there to get my groceries. Hell, I don’t even walk the 3 blocks to the Farm Fresh at 25th and Main! But if it’s going to be all sparkly and cool and the trendy place to be, I’m all for it! Like I said, hope it succeeds but I have my doubts.